Dr Cheng obtained his medical degree from the National University of Singapore in 1993. He then went on to specialize in the field of ophthalmology and won the prestigious Gold Medal award in the Masters of Medicine - Ophthalmology (MMed) in 2000. He was also admitted as a fellow of the Royal College of Surgeons of Edinburgh (FRCSEd) and Academy of Medicine (FAMS). 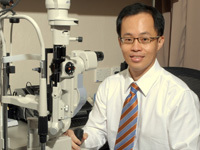 Dr Bobby Cheng subsequently completed his training in two ophthalmic subspecialties; vitreoretinal medicine and surgery, ocular inflammation and immunology. He was awarded the Singapore National Eye Centre (SNEC) overseas scholarship to do a fellowship in ocular inflammation and immunology with Professor JV Forrester at the University of Aberdeen, Scotland in 2002. Upon his return, he completed a one and a half year local fellowship program in vitreoretinal medicine and surgery at the SNEC. Dr Cheng is active as a clinician, researcher and teacher, having over 50 presentations in international and regional conferences. His current research is in the field of dengue maculopathy as well as Fourier domain optical coherent tomography (OCT) scanning of the retina. He had more than 20 publications in peer-reviewed journals including Archives Ophthalmology, American Journal of Ophthalmology, British Journal of Ophthalmology and Retina. He has also won multiple research awards including the Young Investigators’ Award – Clinical category at the 20 th Singapore-Malaysia Joint Meeting in Ophthalmology in conjunction with 4 th Singapore National Eye Research Meeting (2002), Best Poster Award at the Sixth International Symposium on Uveitis, Venezia - Mestre (Italy) in 2004, Best Poster Award the Fifth European VitreoRetinal Society Meeting, Orebro, Sweden in 2005. Dr Cheng is a keen runner and recently completed the StanChart half marathon. He now aims to do a full marathon in the near future.